Sobre el Journal: LL Journal publica trabajos sobre literatura, estudios culturales y de género; y sobre lingüística aplicada, lingüística teórica y sociolingüística, relacionados con los mundos hispanos y luso-brasileros. En este número se abre una sección de poesía y narrativa. Cómo enviar sus textos: Todos los trabajos deberán respetar las orientaciones propuestas en las Directrices para autores (https://lljournal.commons.gc.cuny.edu/directrices-es/). 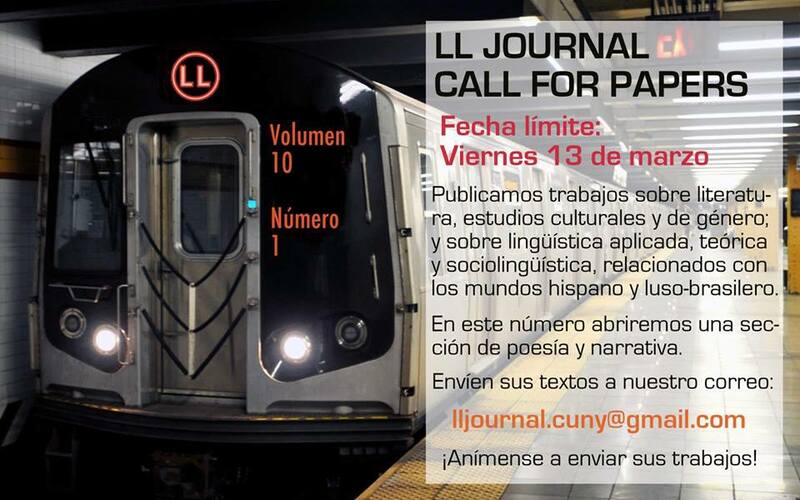 Envíen sus textos al correo electrónico del Journal: lljournal.cuny@gmail.com. Para mantener el anonimato, se incluirán los datos personales en el cuerpo del email, mientras que el trabajo adjunto no estará firmado y carecerá de cualquier indicación de autoría. Si desean, pueden adjuntar imágenes. Más información en la página web del LL Journal. ¡Anímense a enviar sus textos! Conference Dates: April 27-28, 2017. The information below has been provided by the organizing committee of the 22nd Annual HLBLL Graduate Student Conference. In current debates, the idea of a wall becomes a point of discussion from which to explore the relationship between public engagement and academia. Are the walls that separate intellectual, linguistic, artistic, social, and political practices insurmountable? What other metaphors of the wall speak to us? How do we imagine these metaphors and what forms do they take? Who constructs them and who challenges them? When are they useful and when are they not? How do we cross them? 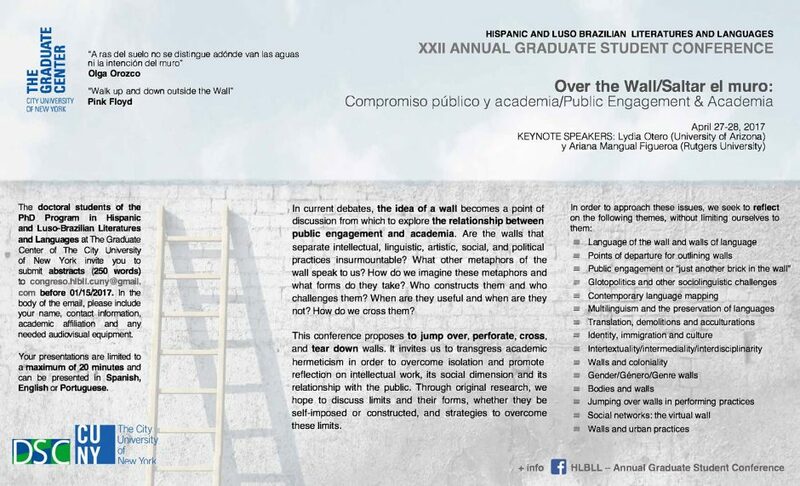 This conference proposes to jump over, perforate, cross, and tear down walls. It invites us to transgress academic hermeticism in order to overcome isolation and promote reflection on intellectual work, its social dimension and its relationship with the public. Through original investigations, we hope to discuss limits and their forms, whether they be self-imposed or constructed, and strategies to overcome these limits. The doctoral students of the PhD Program in Hispanic and Luso-Brazilian Literatures and Languages at The Graduate Center of The City University of New York invite you to submit abstracts (250 words) to congreso.hlbll.cuny@gmail.com before 01/15/2017. In the body of the email, please include your name, contact information, academic affiliation and any needed audiovisual equipment. Your presentations are limited to a maximum of 20 minutes and can be presented in Spanish, English or Portuguese. The LL Journal is a publication of the students of the Hispanic and Luso-Brazilian Literatures and Languages PhD program at the Graduate Center, CUNY. Find out more about the LL Journal and browse their most recent issue (Vol. 11, No. 1) and archives on their Commons site. LL Journal recibe trabajos originales, escritos en español, inglés o portugués, sobre literatura, estudios culturales, visuales y de género, lingüística teórica y sociolingüística, que se relacionen con los mundos hispanos y luso-brasileños. Todos los trabajos deberán respetar las orientaciones propuestas en las Directrices para autores y se enviarán al siguiente correo electrónico: lljournal [dot] cuny [at] gmail [dot] com. Para mantener el anonimato durante el proceso de selección, se requiere indicar los datos personales en el cuerpo del correo electrónico y no en el archivo adjunto que contiene el artículo. Los autores seleccionados serán notificados en un plazo no mayor a dos meses. LL Journal es una publicación coordinada por las y los estudiantes del Programa Doctoral de Lenguas y Literaturas Hispánicas y Luso-Brasileñas. CUNY, The Graduate Center, Nueva York. There seems to be no end to the anxieties, fantasies, pleasures, and possibilities of pop culture—how we consume it, avoid it, appreciate it, and allow it to inform our identities. Yet, can we theorize pop today? And if so, to what extent are we obligated to do so? Conceptions of pop culture are marked by continuous change, constant revision, and ongoing re-appropriation. Pop can be a stabilizer of the canon, with its distinction of high and low, while also a way to subvert the canon’s very foundations through a critique of elitism. If, as Adorno argued, mass culture is a deception, an industry that reproduces passivity and perpetuates the reification of social life, is there a way to escape this repetition? Or can we conceive of pop culture as a potential space of resistance, following the work of Stuart Hall and other British Cultural studies? Furthermore, are mass culture and pop culture coterminous? Pop culture and literary studies have maintained a sometimes-uneasy yet necessary kinship. Thus, Elizabethan popular culture becomes the foundation of the English literary canon, while ephemeral magazine columns and stories become permanent fixtures in the literary landscape. The height of modernism makes reference to “The Wasteland” of mass culture and everyday life, at the same time as it elevates the everyman to Ulysses. The pattern continues today in media forms such as TV, which now displays narrative and artistic complexity rivaling art film of international acclaim. Twenty-first century pop culture presents new questions for consideration: who are we when we absorb or participate in pop culture? The interactive nature of our contemporary forms of pop culture promotes and engages a rhetoric of listening that may in fact imply a dialectical agency for the receiver, rather than blind consumption. However, the politics of this engagement are troubled by various global contexts of reception. Does a study of pop involve universalization and standardization that could pander to dangerous types of political populism or does it engage various registers that foster a productive sense of difference? We invite papers and presentations from all disciplines focusing on works from any historical period and geographical region, including literature, theory, philosophy, visual arts, film, television, social sciences, technology, and alternative media. Traditional papers are welcome, as well as multi-modal presentations and performances. Please submit a 300-word abstract to cunypop@gmail.com for a 15-20 minute paper, performance, or presentation by September 1st. Proposals should include the title of the paper, the presenter’s name, a 50-word bio including institutional and department affiliation, the form that your presentation will take (if it is not a traditional paper), and any technology requests. Paper/Panel Proposals Deadline: October 15, 2016. The information that follows has been provided by the conference organizers and is also available on the symposium’s website. The Spanish section of the Department of Languages and Literatures of Lehman College of the City University of New York, is currently accepting submissions for the Symposium “Representations of fashion and clothing in Hispanic Literatures.” This event will take place on the 7th and 8th of April, 2017. The symposiums will bring together scholars interested in exploring, from diverse theoretical approaches, the topic of dress, fashion, and clothing in different genres and periods of Hispanic literatures. The length of each presentation should not exceed 20 minutes. Papers may be presented in English or in Spanish. Papers will not be read in absentia. The deadline for sending proposals is October 15, 2016. The Organizing Committee will acknowledge all submissions. Notices of acceptance from the organizing committee will go out by December 15, 2016. Once a proposal is accepted, participants should pay a registration fee of $150 (the fee for graduate students will be of $100). A selection of papers will be published in a special issue of the online academic journal Ciberletras. The papers considered for publication will be peer reviewed by the Editorial Board of the journal. The information below has been provided by the conference organizers. Find out more about the conference on their Facebook page and on their website. New proposals of subtopics, as well as initiatives for creating workshops and committees, are welcome. Presentations (to be given be in English, French, Italian, Spanish or Portuguese) shall not exceed a 15 minute duration. Multi-lingualism in states and regions and its negotiation and practice by the communities of use. The scope of the conference is not limited by region, language, or time period. Proposals involving languages taught by the Department of Foreign Languages (Arabic, Chinese, French, German, Ancient Greek, Biblical and Modern Hebrew, Italian, Japanese, Latin, Portuguese, Russian and Spanish) are especially encouraged. Proposals are welcomed across disciplines, from scholars of languages and literatures, education, geography, history, psychology and sociology. Please send an abstract of 250 words by email to: Prof. George McCool (gmccool [at] towson [dot] edu). Please include your name, full address, institution affiliation, day telephone, fax and email address. Please note that Conference papers must be limited to 20 minutes. Faculty at all ranks are encouraged to participate. We will offer discounted hotel rooms near campus, and a graduated scale of conference fees. Pierre Nora, in his essay, “Les lieux de mémoire,” suggests that intellectual inquiry results in the dismemberment of its subject. The self-imposed mission of not just the historian, but of modern society at large, thus becomes to transform this subject back into a coherent whole, to re-member it. The committee welcomes alternative interpretations of the theme. Please submit abstracts (250 words) to rsgsabu [at] gmail [dot] com. 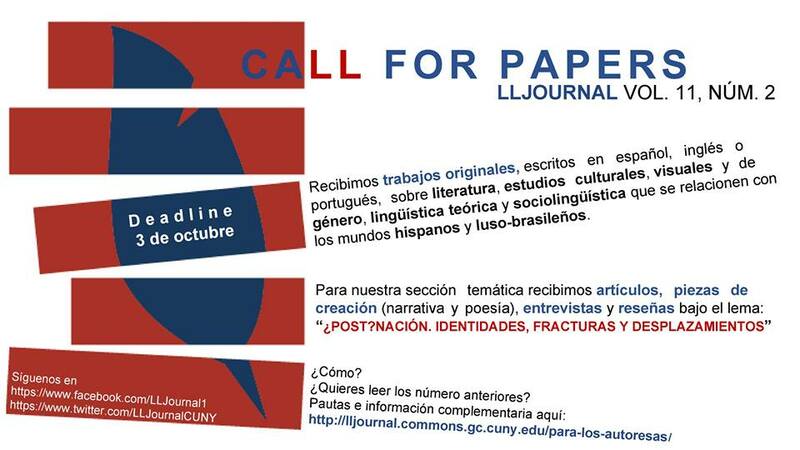 Papers may be submitted in English, French, or Spanish. The deadline for submission is March 1, 2016. Submission decisions will be sent out by March 15.